Look, it’s a reader character! Cammy the Lurkin in charge of stock and supplies at the castle was created by longtime reader Rin! You can bet that she’ll be back again. If you want to create a character to help populate our world (and give us a little bit of cash for spending many hours a week on this comic), click “rewards” up top. The last panel is me whenever I’m listening to Christmas music and any version of “The 12 Days of Christmas” comes on. Or that terrible Paul McCartney song. EDIT: OR SANTA BABY. THAT’S THE ONE I REALLY HATE. Floor six cost 3000 Ides for doors. Assuming that each door, once kicked, will cost the same to replace and that Blank kicked all possible doors, it should be possible to figure out how many doors are on each floor. The final area of floor six had four total doors, including the boss door (Which may throw off calculations). The hallway portion connecting the ‘two areas’ should probably only have two doors, one at each end. As such, it can probably be removed from consideration. If the bottom section of floor six follows the same conventions as the top, with each of the ‘squares’ having a door on each side leading to another square we can probably figure that there is a two-door and a three door square in addition to the staircase/storage rooms, which may have additional doors, though I find that unlikely. All together this leads to 8 doors including the boss door, which may cost more. 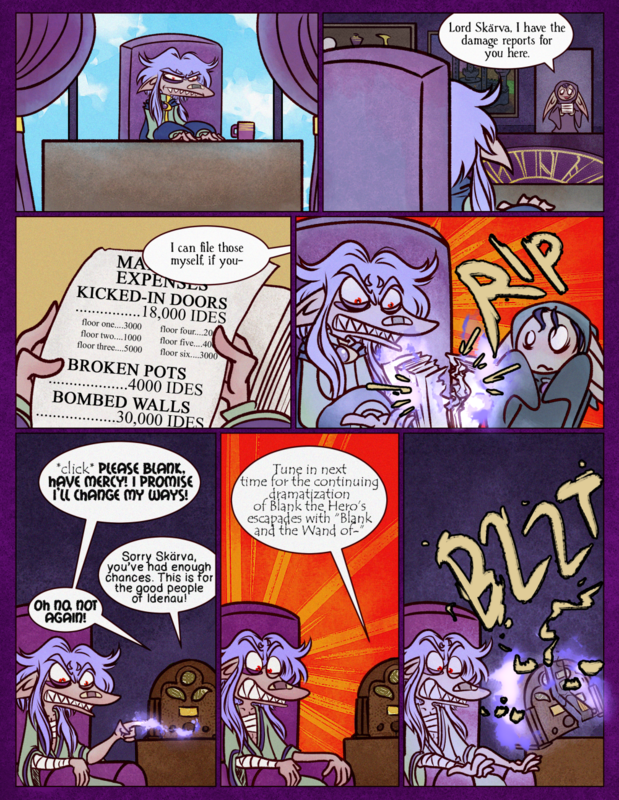 On second glance, Blank didn’t actually kick down the boss door, which puts the tenative door count at 7. If one of those doors was an archway (or more likely a bombable wall), that puts the door count at 6, and the cost/door at 500 Ides. Thirty six doors in a castle is a respectable number. Random numbers; Probably 10000 Ides per wall, and 4 Ides per pot. CAMMY! What are you doing here? Now is not the time for statistics! Go back into hiding where you belong. Skarvs likes mugs, huh? Even before the complimentary ones, he has ’em. And I’m totally with you on those Christmas songs. I swear I Orange Rage at the very mention of them. heroes just don’t understand how much it costs to maintain an effective lair. If Blank saw that bill he might have been a little more careful while raiding Skarva’s castle. Maybe Blank just likes breaking things. I also think that he was raised to kick in doors. It’s the wand of virility. And Blank’s having an escapade with it. On radio, even. As if the nose wasn’t bad enough. Personally, I like H.P. Lovecraft Historical Society’s Christmas music. “I Saw Mommy Kissing Yog-Sothoth” is one of my favorites. Poor Skärva; Blank always comes sooner than expected and now our villain is awash in the blast from Blank’s wand of virility. He could never stand up to such a tough rod throbbing with blessings from the gods themselves. Is this a thing that might be circulating around Idenau, causing everyone depicted within it no end of rage, ensuring that the sun rises each morning? Then one day, Lorelei runs into a copy. I think that would have made the story much shorter as nobody would be able to stand against him without special protection. Like that provided by the gods. I think Skarva suffers from something that I think Blank lacks. Having a soul. He actually does seem to have a moral code of some sort despite being a villain. In fact I wonder if Skarva had a different upbringing if he would have ended up a hero. Who would’ve thought knowing your parents and living in a decent house would make you act more civilized? Does no one love Skarva except the fans? I swear, everyone has somehow mocked or just plain hated him…EVERY FREAKIN’ ONE. Also, Straight No Chaser’s rendition of The Twelve Days of Christmas is the best thing that ever happened to December. It must be the curse. Derk and Lorelei? Don’t they count? I’ll have to give it a listen. I’ve never heard a version of that song I liked… it’s something meant to be sung in a car on a road trip, not just listened to! It must be fun to be able to trash everything with the flick of your wrist. Stimulus, orange, purple. Rinse and repeat. That formula is also what gives him such great hair. The orange adds a fresh citrus scent. Can his face show any more rage? At least he takes his frustration out on paper, bottling it up might make him blow up. I actually don’t think it can. I specifically paced myself these past couple pages to max out on the final panels here. Too bad Skarva isn’t a traditional mage, in that anger makes his magic more powerful. Then he’d show that rascally Blank! Actually, maybe it’s a good thing. From the look on his face in the second-to-last panel, leveling the entire castle would probably be acceptable collateral damage.